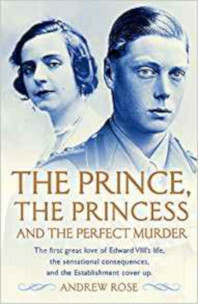 The book behind the widely viewed Channel Four documentary, Edward VIII’s Murderous Mistress. Half a century before Dodi and Diana, another Prince of Wales would be involved in a deadly love triangle with a famously wealthy Egyptian ‘prince’. Edward was the future King of England, a destiny he would famously forsake over his love for Wallis Simpson. But two decades earlier he was involved in another love affair that threatened to jeopardize the royal family. The story took place in miason de rendevous, luxurious chateaux in the French countryside providing hospitality for the British upper classes, the richest food, the finest wines and the most beautiful women, in the violent and dangerous Paris demi-monde where man of the women came from and in the Savoy hotel in London, where a murder was committed. This major royal scandal, superbly covered by the Royal family and the judiciary has remained secret ever since. The Prince, The Princess and the Perfect Murder is the product of several years’ research, accessing unpublished documents held in the Royal Archives and private collections in England and France. First published by Hodder & Stoughton (Hachette, UK) in 2013. “Rose has written a gripping book, enhanced by his elegant style and sharp eye for detail”.